I was hurt in the waist by a sand burden carelessly in 1950 as a primary school student. The waist disease has been on me since then for decades. I had much Chinese and western medicine, I even tried some folk prescriptions for treating it. But the effect is little. 5. It is the pure green treatment without medicine and drug bags, which is safe without side effects. 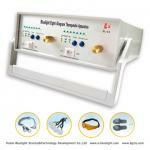 I bought a BL-E type of Bluelight Eight-Diagram Therapeutic Apparatus by mail on 2001-3-16 for treating my cervical diseases mainly. I insist on the treatment 3 times a day according to the 61-65 items on page 42 and page 43 of the treatment guide. There were not many important changes in the first two months, but the miracle happened in the third month finally: My cervical vertebra could move freely, and I felt relaxed of the whole body. There was even an unimaginable result: There was only 30% of my right eye that could see, the rest 70% could not; while I treated my cervical diseases, the part of my right eye that could see extended to be 70%, the rest that could not see only contracted to be 30%. Now, I am insisting on the treatment, the sight of my right eye is turning better gradually. In the second half of 2002, there was a lump appeared on the left side of my buttocks. It was in a thumb's size. Though it was not painful or itchy, but I felt very uncomfortable when sitting. The Chinese physician told me to pay no attention to it, but the oncologist told me to take an operation immediately. 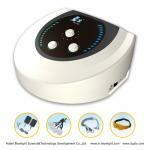 I treated on the Ashi point by Bluelight Apparatus for two months. The lipoma disappeared completely. I used to sleep for one or two hours every night when losing sleep. I tossed and turned restlessly in bed overnight but couldn't fall asleep. So I treated on the Anmian, Fengchi, Shimian points and insisted on soaking feet. My agrypnia was improved soon in 20 days. I can fall asleep quickly now and the quality is very good.